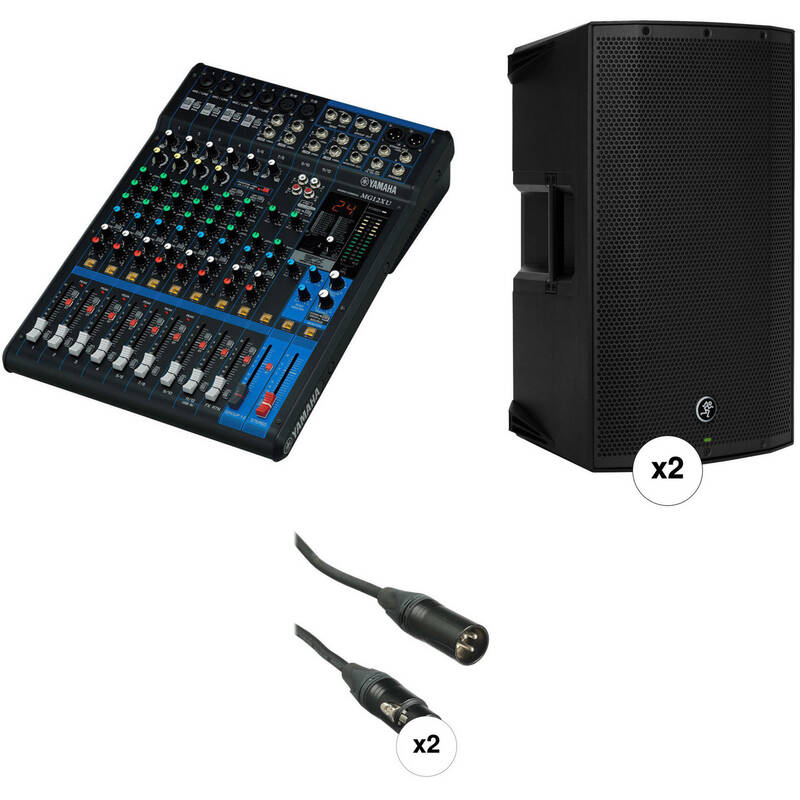 This B&H Kit combines the Yamaha MG12XU 12-Input Mixer with two Mackie Thump12A Powered Loudspeakers and a pair of premium 25' XLR cables to create the primary components of a mobile PA system. The Mackie Thump12A is a 1300W 12" powered loudspeaker with a redesigned amplifier with Dynamic Bass Response, which provides chest-thumping low end for a variety of applications including rehearsal studios, small bars & coffee shops, small night clubs, karaoke events, weddings, houses of worship, fitness centers, and mobile DJs. The loudspeaker features a Class-D amplifier that drives 1000W to the high-output 12" woofer, and 300W into the 1.4" titanium dome compression driver, which combine to provide a frequency response of 50 Hz to 23 kHz with a maximum SPL of 126 dB. The integrated 2-channel mixer features Vita preamps with Wide-Z technology for handling a variety of sources including microphones, Hi-Z instruments, and line signals with ease. An XLR output is available for connecting to other Thump loudspeakers to increase output and coverage. There are four application-specific speaker modes for quick and easy system optimization, which includes a precision digital crossover and transducer alignment. The built-in system protection and thermal limiting is designed to keep your system safe. The lightweight enclosure features four handles for ease in transport, and offers dual angles for use as a stage monitor, while the integrated pole-cup allows the Thump 12A to be used with speaker stands and pole-mounts.